See the world by cruise ship. With hundreds of cruises to choose from, there is something for everyone. Large Mega Ships to Small Yachtlike sailing ships, whatever fits your taste and budget. Sail the Great Rivers of Europe on a barge, the Glaciers of Alaska, the sunny Caribbean, the crystal blue waters of the South Pacific, the capitols of the Europe, the fall foliage of Canada and New England , Trans-Atlantic crossing or even a full world cruise. 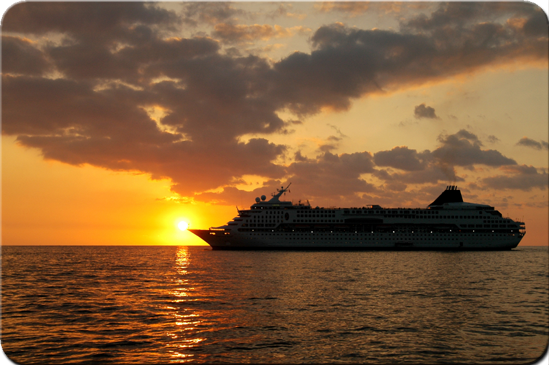 Cruising is different from any other forms of leisure travel. You get to hop from port to port and take your hotel with you. Meaning you only have to unpack and pack once. You see a variety of cultures, while back on board ship you enjoy good food served in an elegant surrounding, almost non-stop entertainment and best of all attentive service. Every year nearly 5 million people choose to go on vacation by cruise ship. They believe it is the best way to see the world and minimize the hassles of travel. As important as the convenience is, however, the destinations are paramount. While a cruise line will maintain that its ships sells the cruise, passenger surveys reveal that where the ship stops is far more important. For that reason choose a Cruise Specialist who understands the geography of cruising – where the cruise ships stop and when, and what the various cruising regions and port cities offer in the way of sightseeing, shopping, water sports, attractions, nightlife, and culture. Cruise passengers spend such little time in each port – usually less than 12 hours so it is important to have up-to-date detailed information of things to see and do. Reminder: When planning your cruise make sure you choose a Certified Cruise Specialist, one that is a member of and has completed the required training and ship visits required by Cruise Lines International Association ( CLIA ). Specialists are at three levels depending on training, knowledge, and experience. The entry level specialist will be an Accredited Cruise Counselor (ACC), the mid-level will be a Master Cruise Counselor (MCC) and the highest level is Elite Cruise Counselor (ECC). Janice Eyman, owner of World Class Cruises & Tours, is certified as an Elite Cruse Counselor. She has the knowledge and experience to guide you to making the best cruise choices.